Unusual early mapping of the transmississippi showing origins of Nebraska and New Mexico Territory. 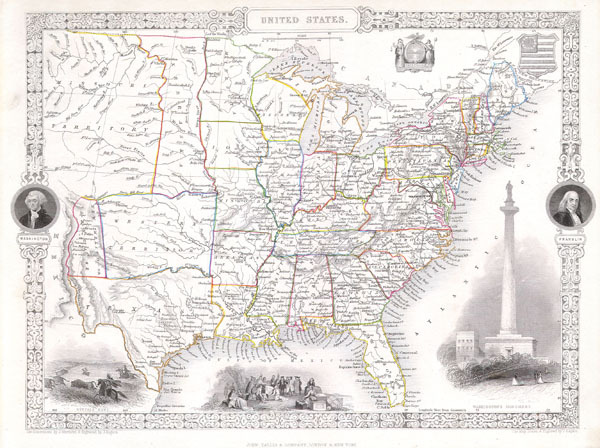 This is a fascinating 1851 map of the United States by the English map and atlas publisher John Tallis and his engraver John Rapkin. Covers the United States from Santa Fe north through the Missouri Territory to Canada and east to the Atlantic. The Trans-Mississippi region is exceptionally interesting with a fascinating (if somewhat inaccurate even at the time) depiction of the political geography. A long narrow Nebraska territory extends to Canada. There is a large 'Western Territory' roughly where Oklahoma is today. Probably the most interesting element of this map is its curious treatment of the New Mexico territory. In the previous edition of this map, 1850, the area that is here New Mexico was part of the original Texas annexation. New Mexico Territory was created in 1850 following U.S. acquisition of Upper California (Alta California) in the 1848 Treaty of Guadalupe-Hildago - which ended the Mexican American War. Curiously, though Tallis is fully appraised of these events, as exhibited by his inclusion of the newly created New Mexico Territory, he does not extend it westward beyond the Rio Grande to include its charter claims in Upper California. Why Tallis made this decision is unclear though it may be a case of carto-advocacy in support of Mexico. Washington and Franklin medallions decorate the right and left borders. Decorative vignettes depicts a Buffalo Hunt, Penn's Treaty with the Indians, and the Washington Monument. The whole has the highly decorative presentation and elaborate border distinctive of Tallis maps. Undated but, published by the John Tallis & Company, London & New York in 1851. Rumsey 0466.071. Phillips (Atlases) 804-70.